Does this come in green? Yes, it does come in this color. Can I use this unit without end panels? The door opening is not large enough for my boat. Also, does it come with two end panels but only one end with doors? The unit comes in a kit with one solid and one zipper panel that can be left off of the unit. 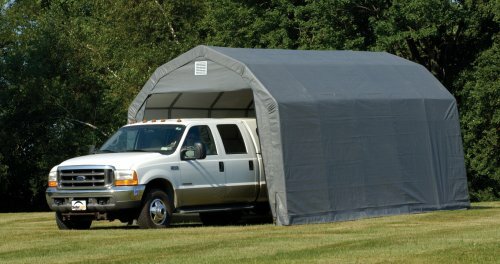 We do not sell the individual solid or zipper panels to modify this shelter. How wide is the door opening at both the top and bottom? The width at the top is 7'3" x 8'9" at the bottom. The height of the door opening is 8' 6" and 9' 8" wide. 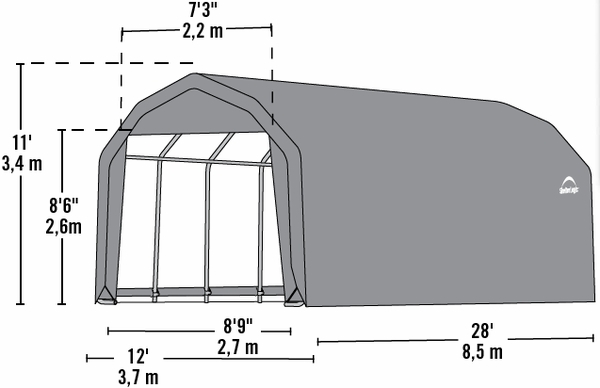 This is the third identical ShelterLogic shelter that I have purchased from eCanopy. The tarp material is well made and has held up to frequent winds in my town. The pipe is heavy enough for my application. ConsSome drill holes in the frame need to be chased with a drill bit to align or size them properly. Some of the pipe fittings are a little crooked (luckily it is not critical to this type of structure).